British homes are increasingly likely to feature smart devices such as connected thermostats, Wi-Fi light bulbs and clever Bluetooth speakers. Among other benefits, these gadgets can augment home entertainment systems, provide additional security and save energy. But we’re also starting to see smart tech deployed on a huge scale in our towns and cities. Smart cities use networks of computer systems and sensors to collect and analyse data about infrastructure and assets, and promise to help authorities manage towns and cities far more efficiently. Examples of smart city technology in use today include automated traffic management, Wi-Fi hotspot networks and parking space sensors. Many cities also offer apps which leverage the data gathered to help residents. Yet for all the advantages, there are concerns too. Smart cities can hoover up a huge amount of information, which has worrying implications for our privacy and freedom. A database of everything from our energy usage to our movements throughout the day would not just be a tempting target for hackers, but offer governments an unprecedented amount of power to monitor every single one of us. This knowledge could be utilised to prevent undesirable behaviour and clamp down on dissenting voices. It sounds like the plot of a science fiction movie, but some countries are already heading in this direction - China has proposed that by 2020 every citizen will be awarded a score based on their behaviour which would affect their standing in society. 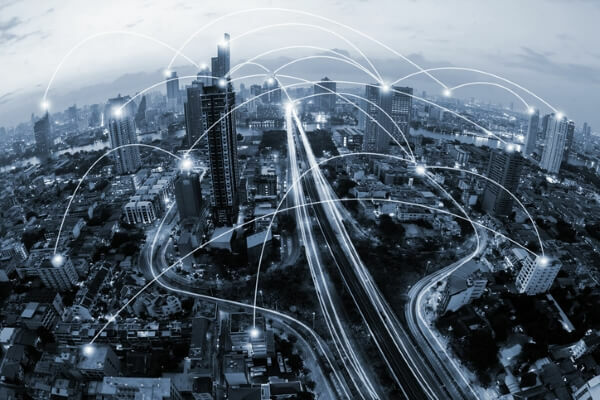 To find out more about smart cities in the UK, Broadband Genie looked at the use of smart technology by British councils, and the public’s opinion of it. Freedom of Information requests were submitted to councils around the UK asking for details of deployed and planned smart city programs, the allocated budget for these programs, who owned the data gathered and whether data was shared with third parties. While a significant number of authorities did not respond or declined due to the cost of gathering the information, we did obtain details of many smart city projects. For instance, energy saving street lamps are in use in Leicester, Cambridge, Aberdeen, Chester, Edinburgh, Glasgow, Reading and York. And council operated public Wi-Fi is found in Belfast, Derby, Inverness, York, Leicester and Worcester (with Inverness council saying it had a budget of £500,000 for the deployment). Councillor Frank McAveety, Leader of Glasgow City Council, said: “Glasgow is at the forefront of the innovative use of data in the UK, and this was recognised when the city won the £24million award from the UK Government for the Future Cities Demonstrator project. We use data to make the lives of our residents, businesses and visitors easier and simpler and recognise its importance now and in the years to come." Other smart city technologies found around the UK include traffic management, bicycle tracking, environmental sensors, air quality monitors, smart waste bins, people counters, Automatic Number Plate Recognition (ANPR), water depth sensors, anti-drowning systems and smart parking meters. Some councils also class broadband improvement projects as part of their smart city work. What do Brits think about all this though? 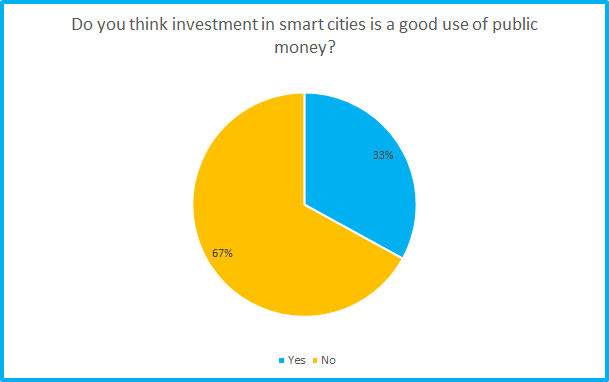 According to our survey of 2,030 people, they may take some convincing: 67% say smart city tech is not a good investment for public funds. A similar number are also understandably skeptical about their personal information being retained. If councils are to move forward with these projects, strong protection of private data is essential to reassure Brits that any data captured is properly handled. The security of smart technology is crucial too. Not only could it be exploited to steal information, it could even be corrupted to damage and disrupt infrastructure. Our survey also suggests more effort needs to be put into making the public aware of smart city technology. 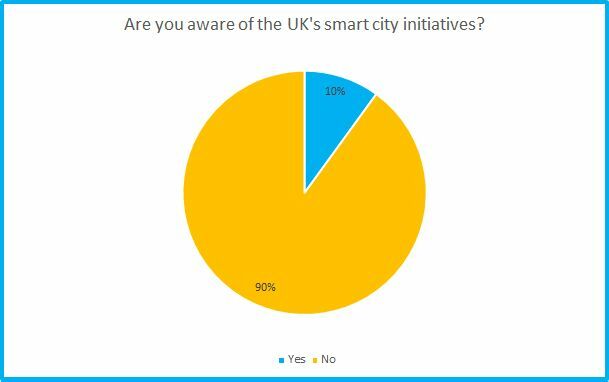 Just 10% of respondents said they knew about smart city projects around the UK. Singapore achieved the top spot thanks to its vast array of smart technology which includes sensors and cameras that can detect smoking in unauthorised areas and littering from skyscrapers. Singapore’s traffic management is also highly advanced with road sensors and smart parking, and city planners use a virtual model of the city to run tests. Its broadband is also among the best in the world, with ISP Singtel offering an incredible 10Gbps connection.